His art was mathematically inspired and consisted of woodcuts and lithographs. M.C. Escher is important because he contributed to the world of mathematical art. All of his artwork was original and very imaginative. He wanted to emphasize shape and depth in his work; he didn't like flat shapes. He was a brilliant thinker for his time. 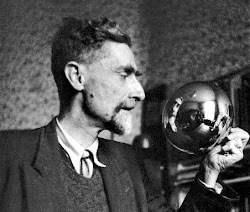 M.C.Escher’s full name is Maurits Cornelis Escher and “Mauk” was his nickname. He is a Dutch graphic artist known for his unique and fascinating works of art. He is known for mathematically inspired woodcuts, lithographs and mezzotints. He was born on June 17th, 1898, in Leeuwarden, The Netherlands. He was a sickly child, and was placed in a special school at the age of seven and failed the second grade. He did not graduate high school. He showed early interest in music and carpentry in his early years and developed printmaking skills while in school. The family moved to Arnhem and he took carpentry and piano lessons until he was thirteen. While he was attending schools from 5 to 20 years of age, he excelled at drawing, but his grades were poor. At age 21, he attended the Haarlem School of Architecture and Decorative Arts, but failed a number of subjects, and ended up studying decorative arts. In 1924, Escher married his wife Jetta, and they moved to Rome to raise a family. In 1935, they moved from Italy to Switzerland and later Belgium to avoid political unrest that later became World War II. Later on he travelled and lived in Italy, Spain, Switzerland, Belgium and then back to the Netherlands because of WWII. 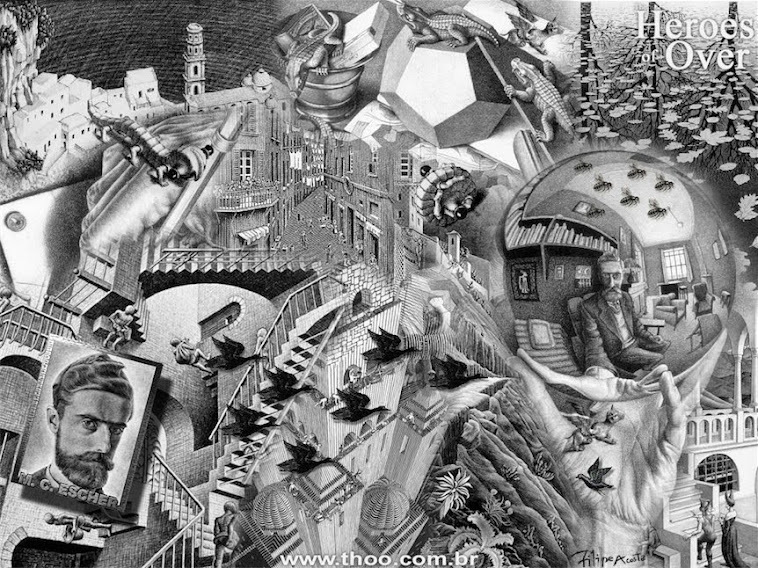 Escher’s first print of an impossible reality was made when he was 39, Still Life and Street. His artistic expression was created from images in his mind rather than from observations. His mathematical influence came from a trip he took in the Mediterranean and studying math directly from mathematicians. Many of Escher's works employed repeated tiling called tessellations. Escher's work in mathematics awarded him with Knight-hood of the Orange Nassau at age 57. In 1941, he moved back to Holland, where he later died. He died at 73 years of age. His last woodcut, "Snakes," was displayed in 1969 and took over 6 months to complete.